Think about all the times you have attend a wedding only to deal with annoying children. You probably even thought, wouldn’t it be nice if this was adults only? 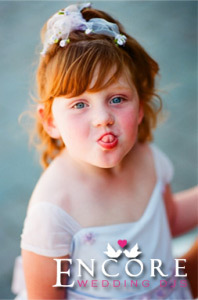 Weddings are a celebration for life of all ages, however the kids might not appreciate what all the adults will. So how do create invitations that specify kids aren’t invited to your wedding? Well luckily we feature an article below that gives you more insight into how to prevent this common distraction. When speaking with brides, sometimes they wonder how to keep children from coming to the wedding. You can prevent this by simply ommiting the phrase “and family” in your invites. Also don’t use the children’s name on the outside or inside the envelope. For example, on the outer part of the envelope only use the guests name, Mr & Mrs. John Park. You would use this same format on the inside portion, and if you happen to know the couple well enough then refer to them by first name only. For family it’s the same thing, you can call grandma “grandma”. Make sure to address them how you would everyday. To recap, only write the person’s names you are inviting and the recipient should get the message. This way they know who is and isn’t invited. Sometimes, family won’t know what you mean and still try to bring more people. Thankfully you have a RSVP list. If you see that a couple registered more people that invited you can give them a courtesy call to give them the bad news. All you have to say is that you can’t afford to have more than 2 people at the wedding. If you are uncomfortable with doing this, than have a mother or father break the news to the guests. I am sure they should understand, and a polite phone call is the best way to inform them about your policy. If you have a day of coordinator, they can also help by making the call for you. First of all make sure your planning company has RSVP services included with your package. This post was originally written by Certified Wedding Planner Tracie Morris of You’re The Bride. Don’t come untied before tying the knot, contact her today by calling 248-408-4602.